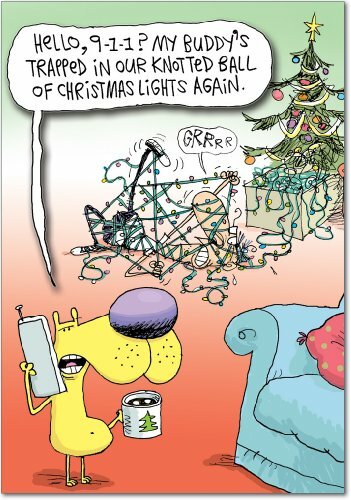 How cute is the doggie calling 911 for his master as he¬ôs all tangled up in the ball of lights It¬ôs definitely a cute and funny way to wish all your family and friends a Merry Christmas. They¬ôd have to be a stickler not to enjoy getting this high-quality card by NobleWorks. NobleWorks' humorous greeting cards have been making people blush since 1980 BC (Before eCards). We offer a huge selection of hilarious Christmas cards to make the season even more merry. Our shameful, over-the-top, hilarious holiday designs can be ordered individually, or in sets of 12 ¬ì if you know that many folks with a twisted sense of humor. All of our funny cards are printed on-demand (and we are very demanding!) in the good ol' US of A on thick, bright, premium recycled paper. Many of our fabulous cards are also available blank to appease one's closeted creative urges, some even come jumbo sized ¬ì oh snap, size does matter after all! There are merely about 7,000 hilarious cards in the collection, from silly to slightly risqu, for a plethora of everyday and seasonal occasions. Dare to laugh!